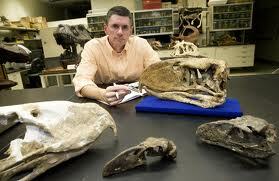 In 1887, Florentino Ameghino discovered a mandible of a giant bird which he named Phorusrhacos longissimus. It was found in the Santa Cruz Formation of Argentina. It lived in the Middle Miocene era, 12 million years ago. As an adult it stood 8 feet tall and weighed about 300 pounds. It was categorized as a predator whose ancestry has been established as a direct descendent to the famous two-legged predator, Tyrannosaurus Rex. It has been given the easier to pronounce name of Terror Bird because of its large size and heavy, sharp beak and talons. Ameghino, the original discoverer had thought it to be a megafauna mammal, so its scientific name did not contain the Greek word for bird: ornis. 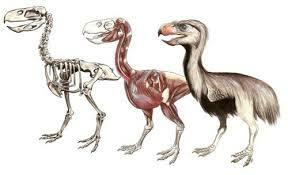 In the history of evolution, birds are descendants of dinosaurs. More recent discoveries have revealed more about the large bird. Unlike the Dodo bird, the Terror Bird never lasted into the modern era, yet was once prolific in South and Central America and migrating to as far north as modern Florida. It is perceived that the mammal predators, Saber-toothed Tiger (Smilodon) and wolf packs helped its way to extinction. Whether the Phorusrhacos was carnivorous or herbivorous remains to be a debate with recent theories being they were primarily herbivorous. CT scans have revealed it may have been both. 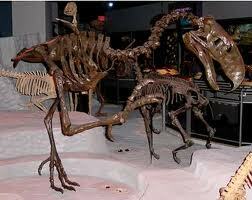 This entry was posted in Darwin's Theory, Paleontology, Science, Video.